Jeffry Wert, author of quite a few books and articles, here covers Lincoln’s trip to visit McClellan after Antietam, and Lincoln’s subsequent decision to fire the general after he allowed Lee’s army to “escape” (as Lincoln saw it). Lincoln shrewdly waited for the midterm elections to conclude before sacking Little Mac on November 7, 1862. Wert also covers Ambrose Burnside’s reluctance to take over as McClellan’s successor. Samuel K. Wilson of Manteno, Illinois is this issue’s Gallery subject. Wilson served with the Sturgis (IL) Rifles as part of McClellan’s bodyguard during the Peninsula Campaign and the Seven Days. While in the service, he caught a fever and was eventually “discharged for medical reasons” in September 1862. Wilson’s life ended prematurely at the age of 24 when he caught another fever and died in 1865. In an age with no instant radio or wireless communication, signalmen were important pieces of the military puzzle. Teams of these men would find high ground or create towers, where they would then use a system involving coded movements of flags or torches to be read by another signal team in the distance. This system was used on both sides during battle, the telegraph being too slow to set up and unreliable when minutes literally meant the difference between victory and defeat. The Confederate Signal Corps was officially established in May 1862, while the Union unit followed in 1863. The discussion for this issue involves Mathew Brady’s “Cooper Union” portrait of Abraham Lincoln, created just before Lincoln’s important speech in front of a New York audience, and George McClellan’s careful preparation for the photographs he took. Both men, says the editorial, knew the important role image would play in their ambitious plans. McClellan, however, is taken to task for spending too much time on image, and not enough on combat and running for President. Harold Holzer, author of many books on Abraham Lincoln, looks in depth at the “Cooper Union” portrait of the future President taken by famous photographer Mathew Brady. Brady took steps to make the homely politician from Illinois appear in a positive light by using Lincoln’s height to his advantage, covering up the future President’s long neck with his collar, and carefully placing symbols of statesmanship and power in the background of the photograph. This photograph was widely disseminated in many different forms before the election. Lincoln himself believed that this image and his speech at Cooper Union won him the election. Frank Williams, chief justice of the Rhode Island Supreme Court, discusses the vote of Federal soldiers in the 1864 Presidential election. In the first instance where soldiers in the field were allowed to vote in a Presidential election, the troops were instrumental in carrying some essential states for Lincoln in closely contested balloting. The main discussion centers around the choice Federal soldiers had to make between Lincoln and former General George McClellan. Lincoln was keenly aware of the difference soldiers could make, according to the author, and he was frequently seen talking to the men in hospitals and on official visits. McClellan, on the other hand, was hampered by the peace stance of the Democratic Party. This stance was at odds with his own personal views on the subject, and the former commander of the Army of the Potomac struggled to reconcile these differences. In the end, the soldiers sided with their sitting President, in effect showing their determination to prosecute the war to the bitter end. The Kentucky Campaign of 1862 culminating in the Battle of Perryville fell far short of what the Confederates envisioned for it in the planning stages. Estimates of between 25,000 to 50,000 Kentuckians joining the Confederate cause and the occupation of Louisville and Cincinnati were nothing more than a pipe dream. In the late summer months of 1862, the Union Army of the Ohio under Don Carlos Buell was moving slowly east from Corinth, Mississippi in the direction of Chattanooga, Tennessee, repairing the roadbed of the Memphis & Charleston Railroad as they went. Braxton Bragg and his Confederate army were to the south in Tupelo, Mississippi. Something had to be done, and done quickly to prevent the fall of Chattanooga. Kirby Smith and his smaller Confederate Army were stationed in Knoxville, Tennessee, further to the northeast. For some time, Smith had been urging that the Confederates invade Kentucky. This gave Bragg the opportunity to join forces with Smith somewhere in Kentucky after a “double invasion” of the state. Bragg sent his men on a circuitous railroad route to Chattanooga and immediately moved north. Smith, operating 100 or so miles to the east, also headed into the Bluegrass State. This aggressive move caught Buell totally by surprise, and he started late in the “race for Louisville.” Bragg at one point had cut the direct route to that all important city, but amazingly he moved out of Buell’s way and allowed the northern force to pass him unharmed. Buell moved on to Louisville and reinforced his army with quite a few new recruits called out in response to the Confederate threat. Smith meanwhile had installed a Confederate governor at Frankfort, the state capital. It was to be very short lived, however. On October 8, just west of the town of Perryville, Bragg fought one third of Buell’s Army and inflicted heavy losses while the other two thirds of the Federal force did next to nothing. Buell, realizing he was heavily outnumbered, decided to retreat back to the southern part of Tennessee. Rather than 25,000 Kentuckians joining the Confederate cause as Bragg and Smith had hoped, less than 2,000 eventually signed up, with many deserting again shortly thereafter. The invasion that had started with such high hopes ended in a whimper. Two of the most famous brigades in the history of the Civil War squared off against one another at Brawner’s Farm on August 28, 1862. John Gibbon’s Iron Brigade, the only all western brigade in the Army of the Potomac, received their baptism of fire in this fierce fire fight. The Stonewall Brigade, along with other units from Jackson’s Wing of the Army of Northern Virginia, was the other famous unit involved in the fight. The Iron Brigade, part of King’s Division, had been marching east down the Warrenton Pike in the general direction of Centreville, said to be the location of Jackson’s Confederate forces. Jackson, however, was a short distance away to the north, hiding behind an unfinished railroad northwest of the town of Groveton, Virginia. Jackson had spied King’s column marching, unaware of his own force, and he determined to strike this isolated portion of the Union army. Over the course of the next few hours, a fierce standup fight occurred near Brawner’s Farm. Gibbon and his Black Hats were joined by several regiments of Doubleday’s Brigade, but King had been incapacitated by an epileptic seizure and was unavailable to add the support of his two other brigades. Gibbon was apparently unaware of this situation and believed the other brigades of the division should have done more to come to his support. Luckily for the future Iron Brigade, Jackson had trouble bringing to bear the vast majority of his force, and darkness ended the fighting in a stalemate. The next two days would see more fighting as Lee punished Pope at the Battle of Second Manassas. Albert Castel covers the wartime service of an Ohio preacher who accompanied Sherman’s army on the March to the Sea. John Davis Vail, the aforementioned preacher, was drafted into the Union Army in the fall of 1864. He decided to join up himself rather than hire a substitute to show that he practiced what he preached. Vail and 200 other recruits were assigned to join the 38th Ohio in the field near Atlanta, and they reached the area just in time to join Sherman’s March. Vail suffered during the trip, often suffering from the effects of diarrhea. He sometimes was forced to ride in a wagon to prevent being left behind in enemy territory. By the time Sherman reached Savannah, Vail had had enough of the army. He managed to procure a discharge and headed for home via a steamer to New York and a railroad trip from that point. Vail’s diary entries highlight the steady pace and rough life a soldier led while on campaign. Jay Wertz is writing a set of articles covering places of interest from Sherman’s Atlanta Campaign. This issue’s coverage moves from Chattanooga to Cassville. Sites discussed include the Varnell House and Prater’s Mill in Varnell, Georgia, the Clisby Austin House, a long railroad tunnel which figured prominently in the earlier General chase, sites near Dalton, Buzzard’s Roost, Dug Gap Battlefield Park, and Resaca. For more information, contact the Tunnel Hill Heritage Center, the Dalton Convention and Visitors Bureau, and the Whitfield-Murray Historical Society. 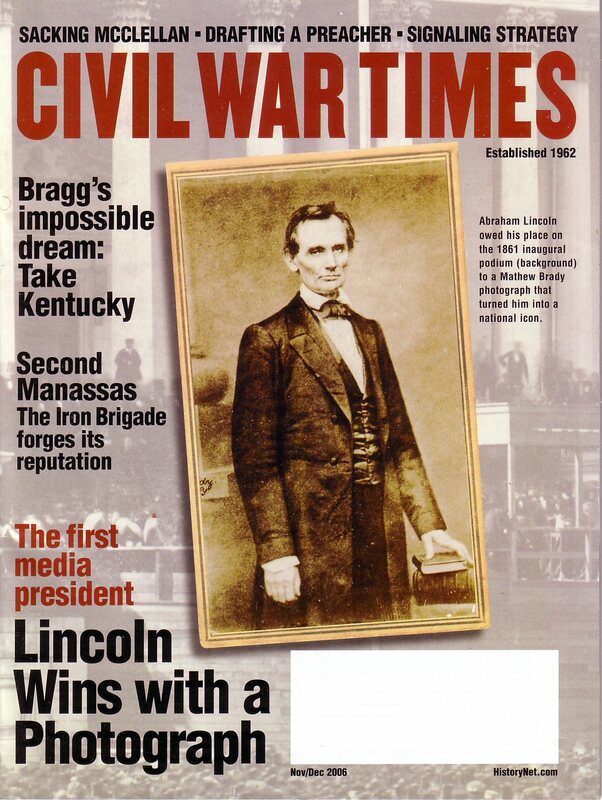 This issue’s Civil War Times Album of the Late War features tidbits on Vice President Hannibal Hamlin, a silk-ribbon badge featuring the famous Lincoln “Cooper Union” photo, horses ridden by famous generals, and a reminiscence of a black soldier after hearing President Lincoln had been assassinated. This month’s picture shows an image of Secession Hall in Charleston, South Carolina. On December 20, 1860, 169 delegates had signed a secession document making official the desire of South Carolina to leave the United States. The die for war had been cast.